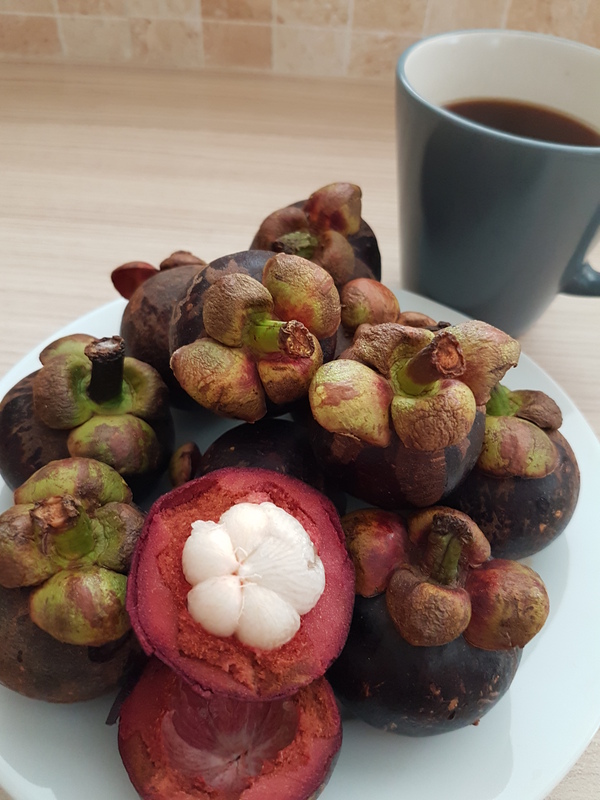 If we were having coffee we’d be looking at the gift of mangosteens from my hubby’s tennis friend. It’s an old, familiar Chinese tradition, to bring gifts of fruit when visiting. When I was young, my Aunties used to do it and depending on whether they were shop keepers or gardeners, I’d have little treats of imported grapes or homegrown mangoes. It’s a cordiality of friendship that I’d almost forgotten while living in Canada. Outside of birthdays and Christmas, Westerners do not typically exchange gifts. In fact, a business colleague once told me how uncomfortable he was when his Chinese employee kept giving him little gifts or souvenirs from her vacations abroad. I remember feeling similarly dismayed in Beijing, when direct reports gave me elaborate gifts for Chinese New Year and Harvest Moon Festival. US corporate policy promptly stopped the business habit. I hear that in newly reformed China, it is now common business practise to refuse gifts lest they be interpreted as bribes. Maybe though, it’s not gift giving that’s different in the west. Maybe it’s the habit of home visits. I remember the front door of my childhood home always being open. A shut wrought-iron grill door might have secured passage from strangers, but the main door was always open. Family and friends would drop by unannounced, their arrival heralded only by the excited barking of the yard dog. In Canada where temperatures fluctuate between plus and minus 30 degrees, the hermetically sealed doors are always shut, locked and barred against the weather. I remember being surprised in Singapore, when I climbed the stairs to my condo and saw the neighbor’s door flung wide open. Their’s was a mirror image to my unit and for one brief moment I thought I had been robbed … except that the thieves had stolen my furniture and replaced it with different pieces. It seems like it’s more of a Western tradition to socialize outside of the home. We meet in coffee houses and restaurants where food is paid for and bills are routinely split. Dinner at home is reserved for close friends and family. Invitation times are strictly prescribed and it’s bad form to arrive late. For these occasions, we bring house gifts – wine, flowers and if you’re so inclined, fresh baked goodies. Once I was invited to a Singaporean friend’s home which she shared with her elderly parents. I’d baked a loaf of freshly made carrot cake. Home baking is relatively rare in Singapore (many of the homes are not even equipped with ovens) and I thought an afternoon treat of coffee and cake would be nice. My friend’s mother had eagerly anticipated the carrot cake but was puzzled when she opened the package. It was brown, had raisins and was sweet? It turns out that Singaporean carrot cake is a savory, stir fried dish made with steamed white turnip cake. There is no carrot in carrot cake. Which brings us back to the mangosteen. This is an exotic looking fruit. Deep purple with chartreuse colored sepals, it is rock hard when green, brittle brown when ripe. It looks like a fruit from my childhood, a Jamaican star apple but that fruit is found only the regions around Central and South America. The Jamaican star-apple is soft, fleshy and creamy with a mushy purple pulp surrounding a mild tasting core. When I break the mangosteen apart, I see that the purple color deepens into a dark red flesh surrounding a white core. The similarity to the Jamaican star apple ends here. The reddish purple interior is dry and woody and the translucent fruit lifts out in to single five piece glob. The fruit itself is sweet and mildly acidic. It tastes like a large skinned grape. And very much like carrot cake … there is not a hint of mango in mangosteen. Posted on May 28, 2016 June 13, 2016 by SandyLPosted in SingaporeTagged carrot cake, Chinese traditions, CoffeeTalk, mangosteen, weekendcoffeeshare.